This one's a head-turner. 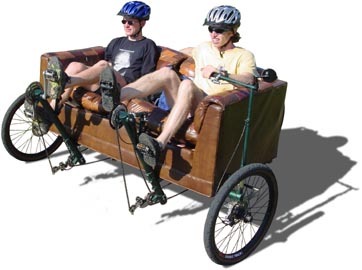 The Couchbike is adjustable to fit a wide range of sofas. Rent the frame alone, or borrow a couch from us. Because this is such a unique product, the rental price depends on the intended use. Please e-mail for rates. Also be aware that the Couchbike may not be legal on all roads. For more on the Couchbike check out the Projects and Trips sections.